The glacier Brøggerbreen and its surroundings in July 2016 which show the characteristics of glacial outwash sediments obtained in Svalbard. Credit: Yutaka Tobo, Ph.D., the National Institute of Polar Research, Japan. An international team led by Japanese scientists has generated significant findings that highlight the impact of high-latitude dust on the conversion of water droplets in clouds into ice—or glaciation—within low-level clouds in the Arctic region. These results contribute to a better understanding of factors at the land surface and how they affect cloud formations. The research findings also add to a better understanding of how climate is affected by clouds, which are increasingly considered to be among the most important, yet most complex, regulators of the global climate. Depending on the conditions, clouds either enhance warming or cool the climate by trapping heat or reflecting sunlight back into space, respectively. Clouds play one of the most important roles in the atmospheric system. They are key players in maintaining the radiation balance of the Earth's atmosphere and are also involved in maintaining the Earth's energy equilibrium. They are made up of particles such as ice crystals and/or droplets that in turn mediate the atmosphere's radiation balance and the maintenance of the Earth's energy equilibrium. When chilled below 0oC, water molecules start forming ice crystals wherever there are minerals or other solids suspended in the water—what are known as nucleation sites. Completely pure water that has no nucleation sites can be chilled well below the usual freezing point and yet remain a liquid—a process called supercooling. Clouds can also be affected by dust particles as they serve as ice nucleating particles (INPs) and cloud condensation nuclei (CCN) allowing ice and liquid droplet formation. In particular, mixed-phase clouds that are made up of water and ice are especially sensitive to dust particles whose source is yet to be fully elucidated. Research to date has mostly focused on arid and semi-arid regions in low-mid altitudes as sources of dust. However, recent findings suggest that dust particles can also originate from ice- and vegetation-free areas in high altitudes, thereby begging the question of whether these particles have the same effect on cloud nucleation as those coming from other regions. 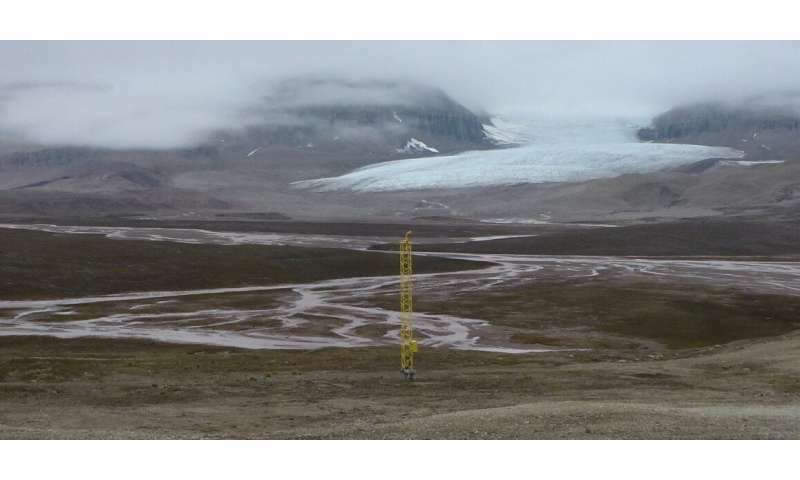 Specific to this study, the researchers considered dust coming from regions of glacial outwash plains, or regions of deposits of sand and gravel carried by running water from the melting ice of a glacier and laid down in deposits. In fact, these regions are thought to be a major source of wind-blown dusts in cold, high latitudes. "We found that dusts derived from glacial outwash plains can serve as very efficient nuclei for ice nucleation, as compared with desert mineral dusts. This is because of the presence of small amounts of organic matter having very high ice nucleating ability," says corresponding author Yutaka Tobo, Ph.D., an assistant professor at the National Institute of Polar Research. "Our field experiments and model simulations further suggest that such glacially sourced dusts may contribute significantly to ice nucleation in Arctic low-level clouds, especially during summertime," Dr. Tobo adds. In the future, the researchers hope to expand their findings by performing additional investigations. "Recent studies have shown that significant dust emissions can also occur in Greenland, North America and Iceland, and we are not yet sure about the ice nucleating ability of dusts released from these high-latitude sources. In addition, it is expected that the recent rapid and widespread retreat of glaciers may lead to more active dust emissions from high latitudes in the future. Therefore, further comprehensive studies will be necessary to understand the possible impact of high-latitude dusts on current and future aerosol-cloud-precipitation interactions in the Arctic, which is more sensitive to climate change than any other region of the world."